Students entering a foundation course in economics are often told, 'economics is the study of choice; of decisions on the allocation of scarce resources between competing needs'. Ecological economics extends this definition to include choices made across time and between generations. In doing so it debates competing views of technological advances, questioning the security they can offer, and interrogates the natures of welfare, growth, development and the measurement of them. It is in the growth/development debate that ecological economics deviates furthest from the common conventions of environmental economics. Where modern economics still assumes a frontier economy, with boundless opportunities for growth, the ecological economist sees a world that is already nearly full. It has to be stressed that this book is, as the title indicates, an introductory text. Anyone hoping for more will be disappointed. It is also a compendium with seven authors. This imposes a cost: the book feels like a series of linked pools rather than a unified stream. It is, however, a text whose authors have dominated the discipline for the last 30 years; it certainly summarises the 'state of the art' in the discipline. The book has four sections. The first, 'Humanity's Current Dilemma', identifies the evidence that the current path of economic growth faces limits. It introduces the idea that economic policy should not simply target the expansion of outputs, but the reduction of raw inputs; making more with less. The second section surveys the history of economics and ecology. Necessarily, much has been left out, and it would be easy to quibble about the balance, but for anyone new to the subject it manages to cover the basics in 60 pages. This section is not easy reading. It feels 'bitty', again probably as a result of multiple authorship; nonetheless, it does offer a reasonable summary of all but the contribution of conventional 'neoclassical' economics. The mention accorded to the neoclassical view is so brief that an uninformed reader might be forgiven for believing that modern economics has had nothing to say on the issue of sustainability. In reality, this topic has been a rapidly growing focus of study since the early 1970s, and a driving passion of major economists including the Nobel laureate Robert Solow. The really interesting portion of the book is provided by the last two sections. From the perspective of a North American reader there is much in them that makes sense and is convincingly argued. However, viewed from a developing world standpoint, some of these arguments are far less persuasive. 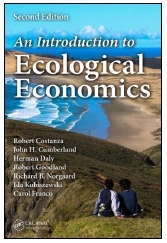 The third section covers the principles and objectives of ecological economics. It compares growth and development, explaining that the former is merely increasing real GDP while the latter embodies improved national welfare. It also explains clearly the deficiencies in our current system of national accounts. Among the concerns raised are the ways in which both the market mechanism and the democratic process often undermine sustainability - both tending to support short-term advantage over long-term resilience. The authors discuss some of the alternatives to GDP and national income as measures of development from the original Tobin/Nordhaus 'measure of economic welfare' onwards, and include a very clear presentation of the theory underpinning Salah el Sarafy's proposed reforms to the national accounts. The ecological threats posed by the modern market system and its use of advertising to promote consumption are extensively discussed. The authors argue that consumption and welfare are not closely linked, and indeed this seems to be the case in high-income states. However, in economies with high levels of poverty, this argument is more difficult to support. Also criticised is free trade. The authors seem to have adopted the narrow arguments made by the protestors at the 'Battle in Seattle' during the 1999 World Trade Organization meeting - trade does indeed cause job losses in the developed world, but the employment opportunities typically reappear in greater numbers in the developing world. They object that trade causes a pollution control 'race to the bottom' because dirty producers can undercut those bound to clean production techniques. Ironically, this argument ignores the World Trade Organization's willingness to allow tariff protection in such cases. They also complain that trade benefits those who pay low wages in the developing world, ignoring the way in which it has caused equalisation of worker incomes, driving up salaries in places like Japan, Singapore, Korea and now China, the very countries to which production has migrated. The authors have not addressed the basic notion that free trade rewards those who produce most efficiently, and that this should surely rationalise resource use and increase efficiency at a global level. The final section, 'Institutions, Instruments and Policies', is the book's high point. Herman Daly has been writing on these issues for decades, and one sees his hand in much of the chapter. The 10-point synopsis of his policies for a 'steady state economy' could be usefully read to parliamentarians every year. He is the complete eclectic, happy to take good ideas from the workerist left (to limit the gap between worker and management incomes, provide more leave, etc. ), from Keynes (to treat the International Monetary Fund as a bank clearing house with penalties imposed on those with substantial trade surpluses or deficits), from conservative Chicago monetarists (to do away with fraction reserve banking and to back all bank deposits 100%) and from modern China (to restrict population growth). The three policy proposals for sustainability show similar eclecticism. The first, use of a natural capital (e.g. mineral deposits) depletion tax, adopts proposals made by Robert Solow. The size of the tax is not specified, but one assumes it would follow the Hartwick rule. The second policy proposal will be recognised by those familiar with current South African mining regulations, a 'precautionary polluter-pays principle' - specifically, a deposit system in which an operator is required to leave an interest bearing deposit sufficient to clear up expected damages in a worst-case situation. The third is the use of countervailing duties on goods produced using unduly 'cheap and dirty' technologies. Interestingly, it is recognised here that this proposal accords with longstanding GATT (General Agreement on Tariffs and Trade) guidelines, whereas the book's objections to trade mentioned earlier did not recognise these guidelines. Again, multiple authorship can lead to internal inconsistencies. In summary, Costanza et al. have put together a useful handbook but not an enjoyable read. An author with a mission can educate and convert readers far more easily than can a consortium of writers. Aldo Leopold, Rachel Carson, Kenneth Boulding and Herman Daly all did this admirably in the past. This text unfortunately reads like the product of a committee, certainly serviceable, but not pretty.